On Thursday, April 4th attorney Mike Koch delivered 48 plate lunches to the faculty and staff of Horseshoe Elementary School. The jambalaya plate lunches were cooked by the RBI baseball team to raise money for their upcoming season. 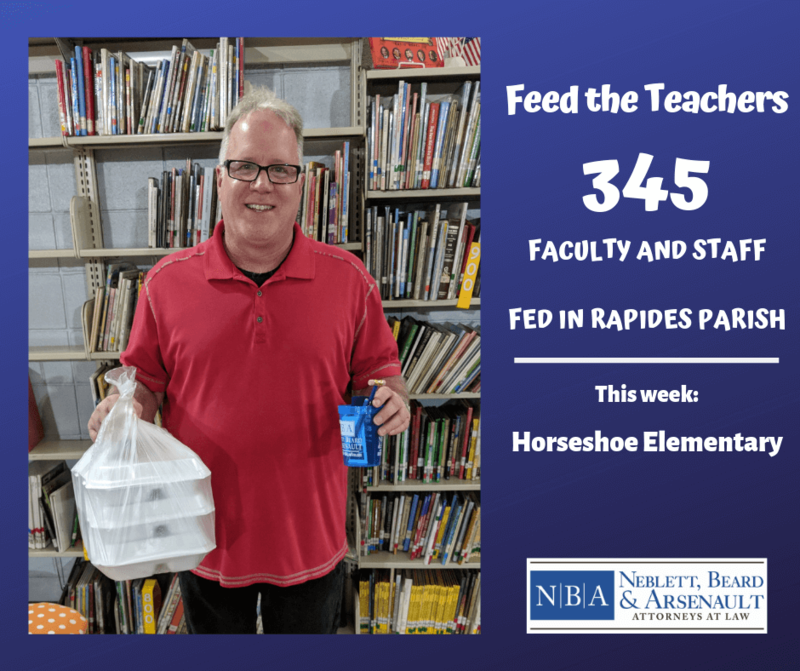 This marked 345 teachers fed across Rapides Parish, with the goal of feeding 1,000 teachers in the parish by the end of the year. “We are so appreciative of the lunches, especially with end of the year testing coming up,’ said Principal Cathy Jones. Bringing lunch to the faculty and staff is the firm’s way of saying “thank you,” for everything teachers do for our communities and its students, and for making a difference.